A call to Scott French at Fraser Yachts in Fort Lauderdale confirms a further price drop of $900,000 on his central listing, the 43.3m motor yacht Princess Sarah. A tri-deck motor yacht built by Richmond Yachts in 2007 and MCA compliant, this superyacht’s interior, comprised of exquisite woodwork and fine marbles, accommodates 12 guests in six cabins. There’s a large owner’s suite on the main deck, a VIP stateroom on the skylounge deck and two double and two twin cabins below. Twin 1800hp Caterpillar engines give Princess Sarah a cruising speed of 15 knots and, says Scott, she’s in perfect, turnkey shape. 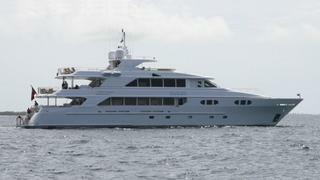 Located in Fort Lauderdale, Princess Sarah is down from $17.5 million to $16.6 million.